Sunday November 2 Cold & unpleasant ground covered with snow this morn & continued to fall by spells all day, Mer 22°+ at 8 o,c, but only rose to 28°+, all seemed less pleasant, having no "sitting room" can use yet. None of us out to church till eve, when Ellery attended M_E_ to hear ...... Anna in awhile with Lena, & soon after a "gent" called. 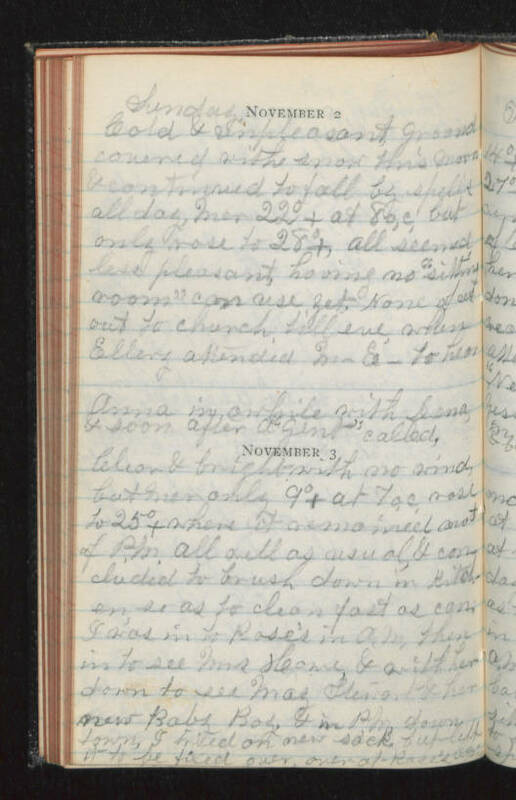 November 3 Clear & bright with no wind, but Mer only 9°+ at 7 o,c, rose to 25°+ where it remained most of P.M. All well as usual, & concluded to brush down in kitchen, so as to clean fast as can. I was in to Rose's in A.M. then in to see Mrs Howe, & with her down to see Maz Stewart & her new Baby Boy, & in P.M. down town, I tried on new Sack, but left it to be fixed over, over to Rose's P.M.